Moorcroft Meadow Thyme 223-4 Discounts Apply ! Limited Edition of 75 worldwide. 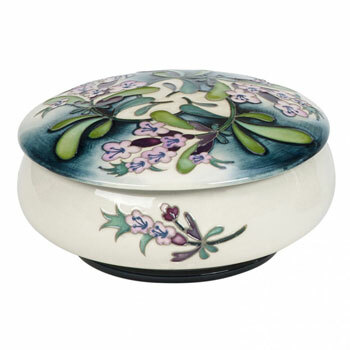 This piece from the Flying Phoenix Collection depicting Meadow Thyme Flower and Seed pods on this super little Lidded Box. Nicola was inspired by the Journey through the Cevennes National Park in the South Of France, with the Flora and Fauna .